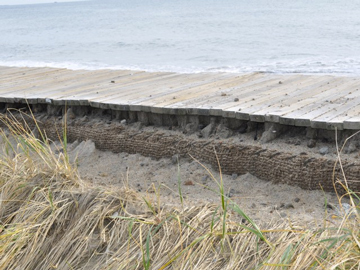 Gabion mattresses have long been used as an erosion control product to stabilize and reinforce coastal banks, stream banks, hillsides and beaches undergoing surface erosion. Traditional gabion mattresses have been made from either steel wire or plastic. In the last three years, NETCO has developed and tested a biodegradable coir fabric gabion mattress as an alternative product to traditional gabion mattresses that use high density polyethylene (HDPE) plastic materials or steel wire. The NETCO coir mattress design can be fabricated to meet almost any project configuration requirement. 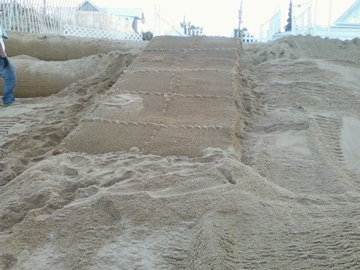 The mattress is a three layer 1,000 gram/layer coir system with an inner liner layer of jute/burlap and comes with internal baffles to hold the rock and sand from shifting. As with traditional gabion mattresses, the coir gabion mattress can be filled with sand, rock, or a combination of the two. 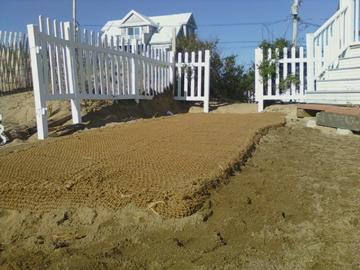 The standard NETCO coir gabion mattress is 9 feet long by 5 feet wide by 1 foot in thickness. A common alternative mattress is 9 foot long by 5 feet wide by .5 feet (six inches) in thickness. NETCO will also fabricate the NETCO gabion mattresses to fit any project design. 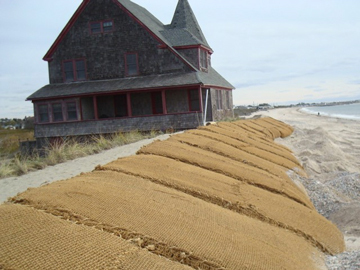 The coir gabion mattress was designed by NETCO to meet the increasing interest by property owners and regulatory bodies in placing sturdy, but biodegradable coastal and shoreline erosion control products in coastal environments. The durability of the coir mattress is outstanding in that it is normally deployed in project configurations where it will remain continuously covered with sand or other cover materials, thereby minimizing UV deterioration. 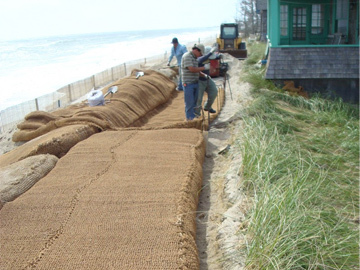 NETCO has utilized the coir gabion mattress system for beach surface drainage layers under other, above ground beach and coastal bank erosion control materials (e.g., coir envelopes, gabion baskets, coir logs/waddles), walkways, as a coastal bank protection system, and as terrace structures on sandy/unstable soils. 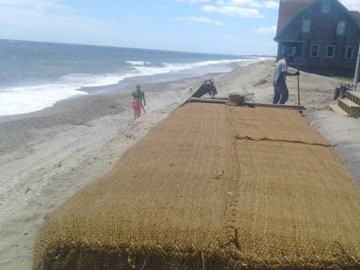 Contact NETCO at 781-863-6270 or email info@netcomanage.com for additional information and quotations on the coir gabion mattress product and/or installation services.